We’re told that the sincerest form of flattery is imitation. If it’s the case that teams are imitating the Houston Astros, then it’s no surprise prominent agents for Major League Baseball players are screaming foul about the phony war going on in the baseball talent pool. In case you haven’t noted, MLB pitchers and catchers report to their spring training camps in about 10 days. If you were one of said pitchers and catchers, you might want to be knowing what city you’ll be headed to when you leave Florida or Arizona. But a whack of those pitchers and catchers— plus their brethren in the free-agent pool— are engaged in a massive game of Dare with owners. 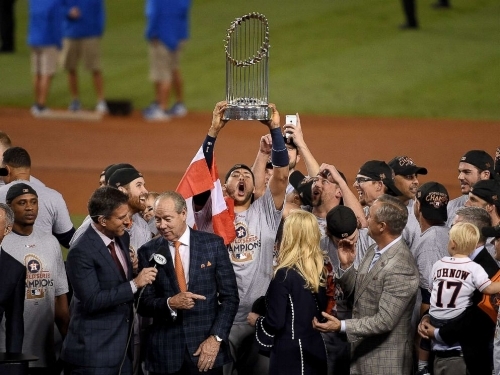 Despite the excited hot-stove talk at the end of the 2017 MLB season, a number of the most valuable baubles are exactly where they were as the Astros won the World Series last November. And you can track it all back to the dramatic win by Houston in the Series. The Astros had been the baseball equivalent of Mr. Bean between 2009-2015, a stumbling, bumbling collation of players not-yet-ready and never-ready. They lost 590 games in those years. They were out of the playoff hunt by May. But it was all a clever ruse. The Astros owners decided that just missing a wild card playoff spot each year with an average team was a Sissyphian exercise. If they were ever to win the first Series in the club’s history they needed to lose a lot (check), accumulate the best young players they could (check) and rise to fight and win another day (check in 2017). It was a ploy that the Chicago Cubs exploited as well on their way to the 2016 World Series win. Get out of the middle class for a while, sell the house, live in a trailer, accumulate credits and then buy a fabulous mansion. To do that, the Cubs and Astros got themselves out of the annual free-agent lottery in which teams paid ungodly sums to players who couldn’t possibly make the difference between mediocrity and a title. The success of the Astros and Cubs formula apparently is not being lost on other teams in MLB. With a hefty luxury tax for going over the salary max each year and no penalty for going right down to the floor boards, a number of MLB team owners are waiting to see just how low they can drive the price tags or trade options on players such as J.D. Martinez, Josh Donaldson, Manny Machado, Yu Darvish, Jake Arrieta and many more. There have been a few clubs such as Milwaukee active in signing free agents. And some dramatic trades for Giancarlo Stanton (Yankees), Andrew McCutchen (Giants), Evan Longoria (Giants) and Gerrit Cole (Houston). Now there is even talk of a boycott of spring training, alternative camps set up by free-agent players to work out and legal challenges in a league that hasn’t had a work stoppage since the disastrous 1994 strike. But the prospect of some very significant players still unsigned by midseason is a real prospect. And they’ll want to be ready when the call comes. MLB has been here before. In 1985-87, owners reached the conclusion that if they didn’t compete for free agents, the price would come down. Unfortunately for them, they colluded on refusing the sign free agents like Andre Dawson, Tim Raines, Ron Guidry, Rich Gedman, Bob Boone and Doyle Alexander. When the evidence was revealed owners had to cough up $122.5 M for fixing the market in those three years. Commissioner Peter Ueberroth (who’d concocted the scheme) resigned. So far, MLB owners have been careful not to record their agreements on driving the player market into the ditch. If they stick to their guns, we could be in for a long game of “after you, Gaston”. As we’ve written here before— and in my upcoming book Cap In Hand— other major team sports are adopting the same avoidance of “paying unless we can win it all”. Tanking is now a thing in the NBA, NHL and (to a lesser extent) the NFL. How fans will react obviously hinges on how long it takes to assemble a great young team and whether they win after years of pain. Just so long as those tanking owners remember there’s only one trophy and 30-32 teams that want it. One sure thing. It’s going to get a lot nastier in the open market for players before a solution is reached in all these leagues.